Lately I have been swatching new collections like my life depends on it, and hope to get a couple of them posted asap. Some greaaaat new colors this spring/summer. It's funny, there are some that I expected to love, yet don't, and some I expected to dislike, but love. Goes to show that you never can tell. I'm working hard to be a more frequent poster again, even devoting some of my lunch hours. (my only time of respite from the daily grind, as it were) Even today, I'm typing this over a steak taco salad with corn salsa, sour cream, cheese, and of course, guacamole from Chipotle. Not really my first choice of lunch, but it's the only place near work where I can order and pay online. (I forgot my wallet at home this morning) Still tasty, but the corn salsa is burning my face off. Anyway, I digress. I always love when I find cool patterns out in 'the wild', so to speak. When I say in 'the wild', I refer to when I'm out doing other things, whether it be grocery shopping, clothes shopping, or out running office supply errands for work. In this case, the pattern I loved was actually the pattern covering a spiral notebook or planner, I can't remember off the top of my head. 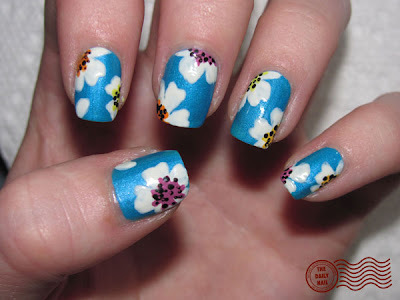 I loved the bold pops of color that took the white and black flowers to another, more mod level, and we all know how much this blogger loves her mod. Also, who can resist clean, bright colors that pop off the nail? Not me, that's for sure. For this design, I even got to use one of the new Mod Mattes from Zoya, Phoebe, which looks amazing with top coat. I used Zoya Phoebe as a base, with American Apparel Cotton for the flowers, American Apparel Hassid for the center dots applied with a dotting tool, then American Apparel Manila, Finger Paints Heavenly Hydrangeas, China Glaze Electric Pineapple, and Zoya Jancyn for the center colors. Topped it all off with 2 coats of Seche vite top coat. Doesn't Phoebe glow? Love it. Where is your favorite place for inspiration?